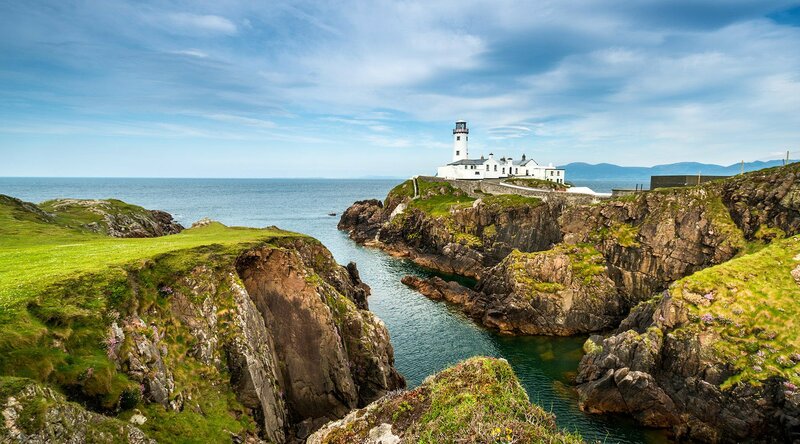 With world-class golf, striking promontories jutting into the ocean, and an unmistakable, roguish spark, Donegal offers a glance at a forgotten Ireland. It’s a land far away from tourist hot spots, where the sun shines brilliantly over mountain passes, historic castles, and charming coastal pubs. Your journey to Donegal begins in Killybegs, a charming fishing village that is also Ireland’s largest fishing port. From here, make your way to the banks of the River Eske, where Donegal Town sits in the shadow of the Blue Stack Mountains (part of the famous Hills of Donegal). Travel back in time at Donegal Castle, explore the Gothic ruins of the Franciscan Abbey, and stroll through The Diamond—Donegal’s city center—where you can shop for authentic Donegal tweed garments and Aran knitwear, then enjoy a meal (and the best views of Donegal Bay) at Dom’s Pier One. Golfers dreaming of playing a round on a championship links course should immediately make their way to Murvagh Golf Club. Nearby, you’ll also find Murvagh beach—perfect for a relaxing time spent watching the waves lap against the white-sand shores. All aboard for a journey through the history of County Donegal’s narrow gauge railway system. Browse vintage posters, tickets, and photographs, view rare film footage of the railway in action, and enjoy the meticulously detailed working scale model vintage railway. Explore Donegal’s meandering coastline while learning about local lore on a Donegal Bay Waterbus cruise. These rollicking tours are the perfect way to get a lay of the land and a taste for the legendary Irish gift of gab. Built by Hugh Roe O’Donnell—one of the great O’Donnell chieftains who ruled Ireland’s northwest—in 1474, O'Donnell Castle is the centerpiece of Donegal town and reveals the untamed history of County Donegal.